Update: Looks like this is the least-popular new device from Pebble - it's still got stock left on the Kickstarter page. Read on to see why we think that's a little surprising. Pebble has struggled to stay relevant in a market which is now dominated by the Apple Watch, and to a lesser extent a fleet of Android Wear smartwatches, but it's hitting 2016 hard with a trio of new wearables. 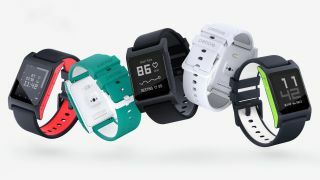 The Pebble 2 is a second generation offering following on from the Pebble Classic, and it's been joined by the more premium Pebble Time 2 and all-new Pebble Core. All three come with more of a fitness focus than previous iterations – and the Pebble 2 now boasts a heart-rate monitor and activity tracking, bringing it in line with its Apple and Android rivals. Pebble has opted to take to Kickstarter again for its Pebble 2, Pebble Time 2 and Pebble Core launch, meaning there will be a good old wait between the campaign going live (which it now is) and products landing on wrists. In terms of the Pebble 2 release date, the watch is slated to start shipping from September – assuming everything goes to plan. It should, as Pebble is now a veteran of the crowd-funding world with several successful campaigns already under its belt. That means its supply chain should be ready and raring to go as soon as the Kickstarter ends. For those who take the plunge early on Kickstarter, you'll be able to nab the Pebble 2 for US$99 (around £70, AU$140). After then, Pebble expects the watch to retail for US$129 (around £90, AU$180). What's interesting is, well, the lack of interest in this lower-end watch from Pebble. A quick look at the Kickstarter page there are nearly 3000 of 10000 early bird specials for this smartwatch, which is amazing given the interest in the Pebble Time 2 and Pebble Core - this could be the place to get a cheap second-generation Pebble. You can pick the Pebble 2 up in five different colors (Black, White, Aqua, Flame, Lime), and thankfully it sports a more slender design (39.5 x 30.2mm) compared to the bulky bezel of the Classic it replaces. It's not super slim (9.8mm), and it appears to be slighter longer than the Pebble Time 2, but it should sit a little more nicely on the wrist than the original Pebble. Nor is it premium. Polycarbonate is still the material of choice, but that at least keeps cost and weight (31.7g) down. The familiar trio of buttons adorn the right side of the watch, while the fourth key remains on the left. There's a built in microphone allowing you to record voice notes, and the Pebble 2 is also water resistant up to a depth of 30 meters, which means you'll be able to jump in the shower and not take it off. Pebble's stuck with the same e-Ink display technology found on its first smartwatch, with the Pebble 2 packing a 1.26-inch E-paper display with a 144 x 168 resolution. Coated in Gorilla Glass 3, it should be nicely protected. There's no color then, just high-contrast black and white. That means it's super easy to read, even in direct sunlight, but you don't get any fancy graphics and it reduces the functionality. One of the biggest draws for the Pebble line is their ability to work with both iOS and Android. You can use the Pebble 2 with the iPhone 4S and above, with your phone running at least iOS 8. Meanwhile on Google's platform you'll need a smartphone running Android 4.3 Jelly Bean or above. Sadly those rocking BlackBerry and Windows handsets, there's currently no support for you. At the heart of the Pebble 2 is an ARM Cortex M4 processor running the Pebble OS on the E-paper display. Bluetooth 4.1 allows the Pebble 2 to connect to your smartphone, but there's no Wi-Fi or GPS on board. It's very much reliant on your phone, and without it the Pebble 2 won't be able to do all that much above showing you the time and date. The inclusion of a heart rate monitor and activity tracker will help the Pebble 2 appeal to those who put fitness first when it comes to choosing a wearable – and it could give the likes of FitBit, Jawbone and MisFit something to worry about. Pebble 2 battery life is another high point for the wearable, with the firm saying it's good for 7 days of usage on a single charge. That blows the Apple Watch and Android Wear options out of the water with most failing to get past the two day mark.